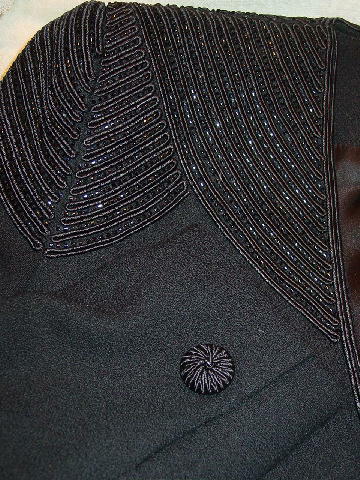 This vintage black 100% wool evening jacket is by Nolan Miller and was made in Hong Kong. It has a very nice full black 100% acetate lining and a separate black (probably polyester) shiny shell. 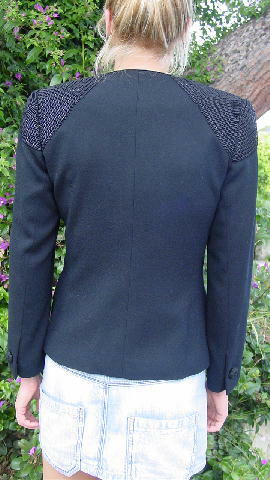 It has shoulder pads and long sleeves with one button on each. There are two faux buttons on the front, and under those are the two front snap closures. The buttons have a high-low cord effect. It's collarless with a 9" long V neckline and two lower flap pockets which are still sewn shut. The upper part and the pocket flaps have rows of cording with black beads in between. The tag says size 4. The front center is 1 3/8" longer than the back. shoulder pad to shoulder pad 17 1/2"
end of shoulder pad to end of sleeve 23 1/2"
shoulder to hem 23 1/4"
bottom hem side to side 17 1/2"
armpit to armpit 18 5/8"
top front side to front side 15 1/8"
across top back (elastic stretched) 17"
top front to bottom hem 15 1/4"
top back to bottom hem 12 3/4"
bottom hem side to side 18 1/4"